I’m thinking of calling her Sophie, I don’t know why, she just seems Sophie-ish to me. 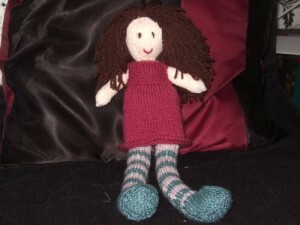 She was really quick and a pleasure to make, using up little odds and ends of yarn (more stash busting woo!) I think I will probable make more of these in future. 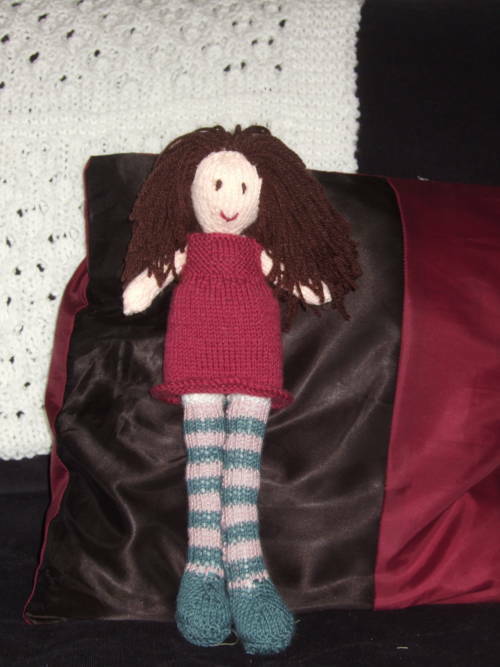 The hair did take a long time to stitch on though, maybe I did sew it a little densely, but she seemed odd with little pink patches on her scalp, maybe if I use a thinner yarn next time, although I think she has a lovely head of thick brown hair! I love her long stripey legs! All in all I think a pretty successful knit, and here for those of you who don’t remember the 80s cartoon (I have to admit to needing a nudge to remember it myself, I seemed to have merged it with Super Ted in my mind but it was so long ago now) is the intro to Raggy Dolls, maybe it will ring a few bells! I used the backwards loop cast on method for those 10 stitches, not my favourite cast on but it has been transformed since I stumbled on this article on TECHknitting which suggests only casting on 2/3 of the required stitches on the first row then adding the rest on the following row to take up the horrible slack you get with the backwards loop cast on. As for the gap, I think this is unavoidable and intentional as you will see in the making up notes on the pattern, you fold and sew these 10 stitches to form the top of the shoe.